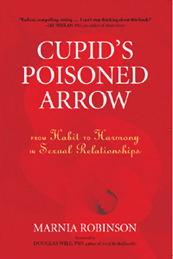 This book by Marnia Robinson is a must-read for anyone interested in understanding sexual relationships. If you want to improve your relationship, this book is for you. With examples from her own relationship Odyssey Marnia shows in an entertaining way that we are biologically programmed to fail unless we focus on bonding rather than on orgasms in our relationships. She backs up this message with solid scientific evidence. Hit by Cupid’s arrow! What an exhilarating, enviable state of affairs. in spectacular fights interspersed with passionate reconciliation. in the lab, given experiments like this one.) After a while, the fireworks stop. enough for him to gallantly attempt his fertilization duties. A rodent’s renewable virility is not indicative of an insatiable libido. Read what other readers have said about Cupid. You may order Cupid through any bookseller, or from Random House, Amazon or Barnes & Noble.